A travel bursary from A-N helped fund an experience that de-stabilised my art practice, opening new and surprising directions while introducing me to some wonderful people and experiences. 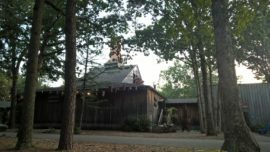 Because of the award, I was able to participate in a six-week Fellowship at the Creative Glass Center of America (CGCA), in Millville, New Jersey. The list of previous Fellows is a roster of significant artists in the field, and it was an honour to have been chosen. While there I developed no fewer than four new directions for my work, which have forced me to re-define who I am as an artist and maker. To this point, my work has centered around creating illuminated one-off three dimensional images by enamelling onto multiple layers of glass. It is complex, subtle, time-consuming hand made work. During the Fellowship I worked with digital production, repetition, and unusual surfaces, from Kleenex box holders to mobile phones. My proposal for the Fellowship was to explore and create contemporary memento mori (remember you will die) images, exploring 21st century notions of existence and non-existence. The goal was to do this in a setting where I could critically engage with colleagues, the curatorial staff of the related Museum of American Glass, and especially Hank Adams, CGCA’s renowned Creative Director. CGCA is a curious beast. It is a centre of excellence for the nurturing and creation of art made with glass, with highly skilled staff working with Fellows and visiting artists to realise a wide range of works. It’s set within a Disneyland-inspired mock historic village celebrating the region’s industrial heritage. These different components intersect in curious ways. I arrived in the swampy heat of late August and met my fellow Fellows. Our experience, paths, explorations and approaches to working with glass were radically different from one another. Our conversations and struggles helped flesh out the experience. 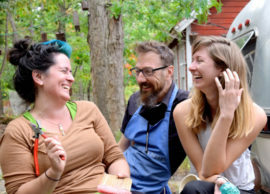 Check out the work of my fellow Fellows: Rachel Rader, Anna Riley and Helena Parriott. 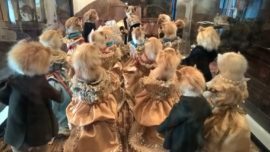 While in the US, I had the chance to feed my fascination with all things morbid by visiting some extraordinary sites and exhibitions. 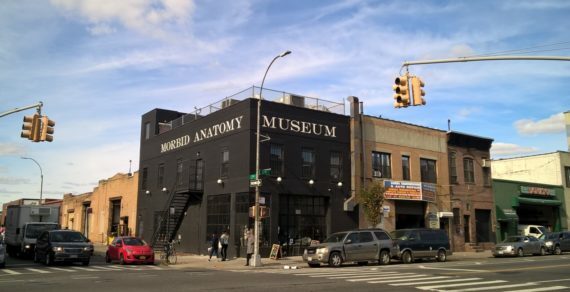 (https://www.nytimes.com/2016/12/20/arts/morbid-anatomy-museum-closes-brooklyn.html) It featured, among other items, a large collection of the famed Victorian taxidermist, Walter Potter, the so-called “man who married kittens.” It was a fortunately timed experience, as the Museum permanently closed its doors just two months later. I also visited the fascinating exhibition Securing the Shadow: Postumous Portraiture in America at the American Folk Art Museum in Manhattan. 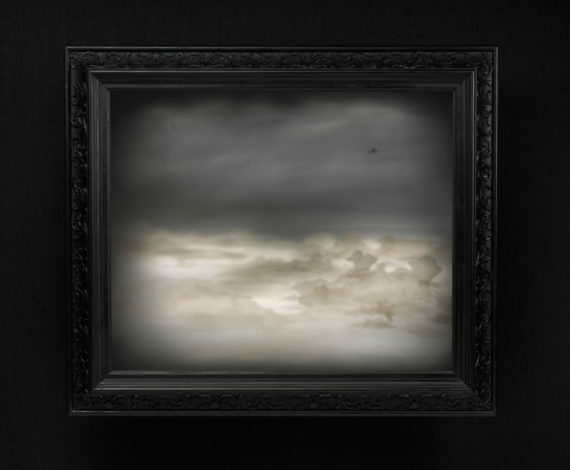 This exhibition, which included an installation of postmortem daguerreotypes, was a moving examination of the many ways in which people in 19th century America remembered their dead through images. The range of imagery and the depth of scholarship in the exhibition and its catalogue have helped me further refine my ideas of remembering the dead in artwork, and provides a continuing resource. 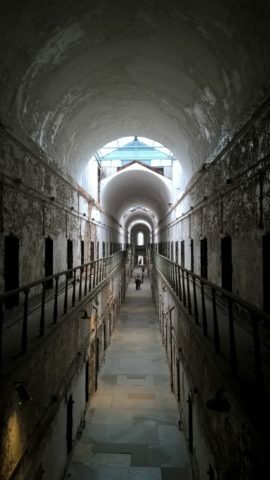 In Philadelphia, I visited the famous Mutter Museum and the infamous Eastern State Penitentiary. 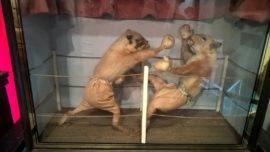 The Mutter is one of the world’s leading anatomical museums, and treads the fine line between presenting specimens that have research value and sensational oddities. The sensational aspect is certainly what draws the crowds, but the seriousness of the collection asserts itself. 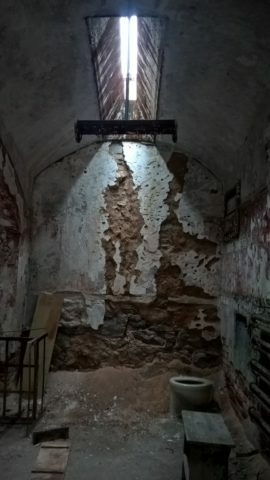 Eastern State is a semi-ruin and was once one of the most famous prisons in the world. In addition to showing the ruins, they explore the role of prisons and sentencing in contemporary culture and present an arts programme. The Fellowship came at a frightening time, politically. In the UK, the Brexit debacle had just happened, and in the US we were in the final months of the US Presidential election, which would deliver a victory for Donald Trump. Perhaps the driving force behind both of these disasters were deliberate campaigns to foster a sense of fear of the other. Not only were citizens encouraged to fear the foreigner, liberals and conservatives were being hammered with propaganda to make us fear each other. It was an atmosphere of fear, and this fear was reflected in the media, social media, political rallies, in conversations, and on the street. And the fear generated in one segment augmented the fears in the others. 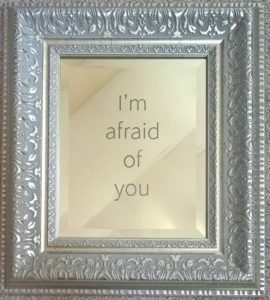 In the thrift/charity shops I bought mirrors and laser etched the text “I’m afraid of you” onto all of them. There were grand etched mirrors in gilded frames, make-up mirrors, medicine cabinet mirrors, full-length mirrors, children’s mirrors with things such as “angel” printed on them, stainless steel ‘safety’ mirrors, vintage mirrors with black spots, mirrors that served as decorative accents, and mirrors with no adornment whatsoever. Each mirror suggested a gender, age, socio-economic status, and taste. Some were mirrors to be used, and some were purely decorative; some were of good quality and others cheaply made. 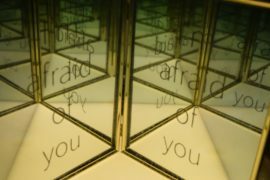 The idea was to create a mirrored chamber, where these diverse mirrors would reflect and echo the text, the viewer, and anyone else who was in the room at the same time. Again, time and facility constraints prevented an installation, and most of the mirrors are stored in a house in the US awaiting exhibition. 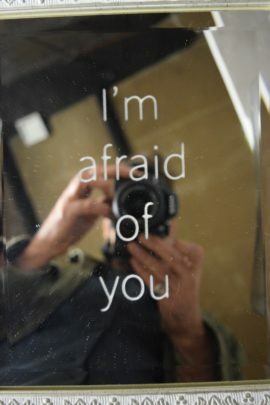 Some were installed in the exhibition Embracing Narrative at the Portsmouth Art & Cultural Center in Virginia during the international Glass Art Society Conference in 2017. Another iteration will take place at the Royal Scottish Academy in Edinburgh in early 2018. While on the Fellowship I spent a lot of time in the various thrift/charity shops in the area. The sheer waste of consumer culture was on full display in these sprawling stores, which were themselves outnumbered exponentially by the retail sprawl that dominates even this isolated region. 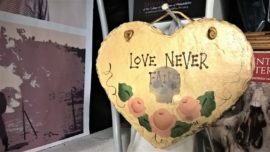 I started buying items that were meant to be “special” gifts – mass produced plaques with homilies in a “country craft” style, ‘Love Never Fails’ wall plaques, ‘World’s Best Mom’ ashtrays, faux fancy Kleenex box holders. I’d take these items an laser etch skulls onto them. My intention was to gather enough items to re-create a domestic interior entirely populated by these items. 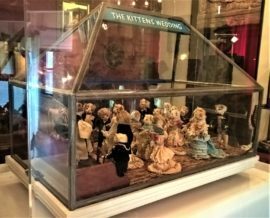 In the end, there wasn’t enough time to create the installation; most of the items were returned to the charity shops (singularly, so as not to arouse suspicions). I wonder what has become of them? While working with the laser, I began to consider the most commonly touched item in most people’s lives – the screen of their mobile phone. 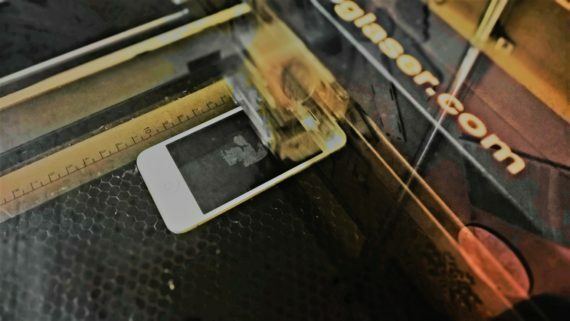 I took a deep breath and stuck my old mobile into the laser and discovered that, not only did the laser etch the glass screen, but the phone continued to work perfectly. 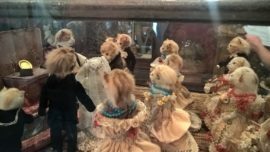 In revisiting the theme of memento mori iconography, I was moved by the number of remembrance items that were designed to be handled, worn and touched. 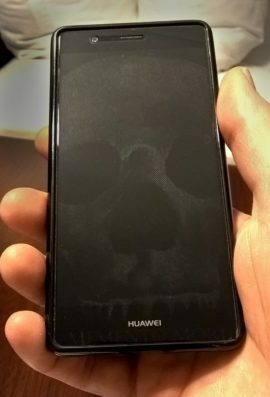 I started to etch skulls onto mobile phones and screen protectors. 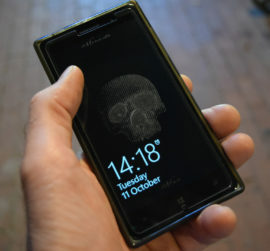 This thought, begun during the Fellowship, has grown into a new series of works in which I give screen protectors that have been etched with memento mori imagery to friends and family to use on their phones. 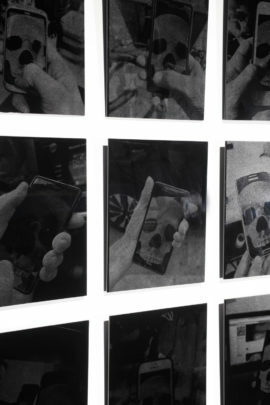 They then take photos of them using the mobiles, and I etch these photos onto black glass to create an installation. This version was accepted into the 2017 British Glass Biennale. 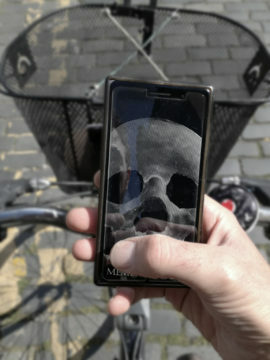 I used the residency to develop new work exploring death in the digital age. The root for this work lies in a simple act: I Googled my first lover, and he wasn’t there. John died of AIDS in 1995, part of a generation of lost gay men. Fast forward twenty+ years and it often seems that the entirety of the world can be found on-line. The internet is where see our lives reflected back at us. It shapes how we view our reality. But this man, who was so central to my life, has never existed on-line. This simple realisation re-opened a wound, and created a new void. I wanted to create work that explored this void. Memento mori imagery in the West has an established set of symbols and motifs. I wanted to explore devising symbols that would be only be possible in a digital age. 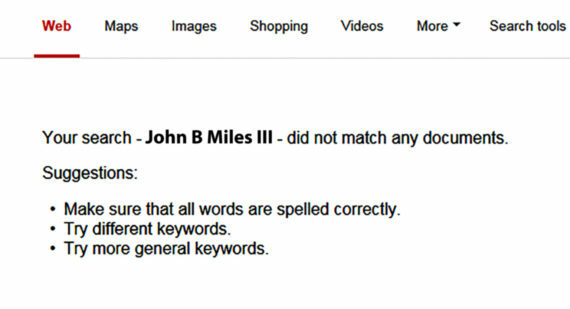 I began using the text of the Google search “Your search – John Miles & Jeff Zimmer – did not return any documents.” I thought that a digitally-generated response needed to involve digital processes in its rendering. I found a digital makerspace, Steamworks in a nearby town, so began a regular journey hauling sheets of glass (and, later, other materials) on a 40 minute journey on Southern New Jersey’s rural buses. Fortunately (for me) this was a criminally-underused facility, so I had ample opportunity to explore. 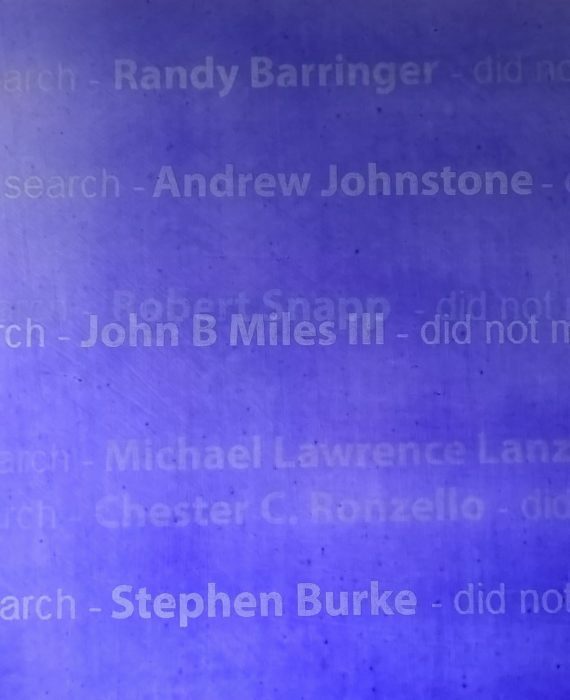 nto the enameled sheets of glass, thus creating a layered work with dozens of names. In addition to the blue enamel, I painted panes of glass with the most expensive enamel – gold ruby – befitting of a memorial to a precious person. Instead of painting an intense layer of enamel onto one layer of glass, I decided to paint a thin layer onto many layers of glass. 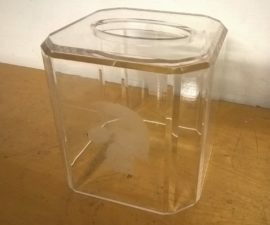 The depth of layers of glass suited the depth of my emotional experience of loss, and the repetition of the text suggested the continual experience of loss. 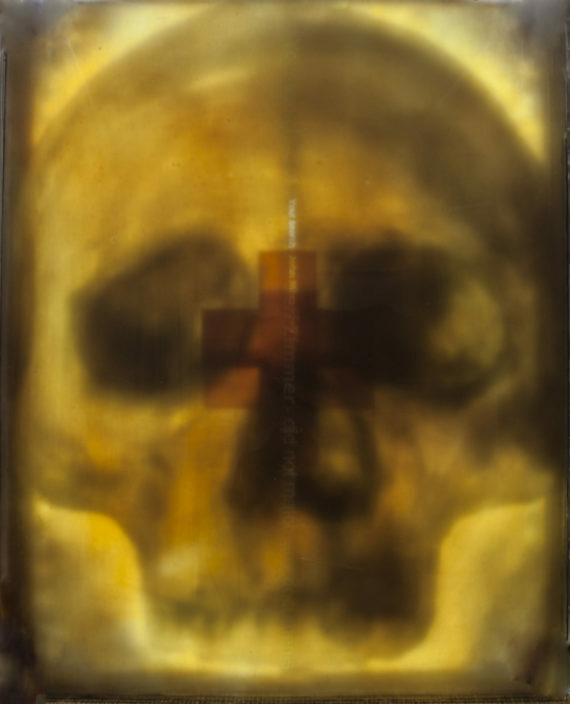 The accumulation of the multiple layers began to resemble the saturation of colour found in Andreas Serrano’s Immersion (Piss Christ), a work whose iconoclasm suited John’s spirit. These many layers of glass provided many options for creating and assembling works. 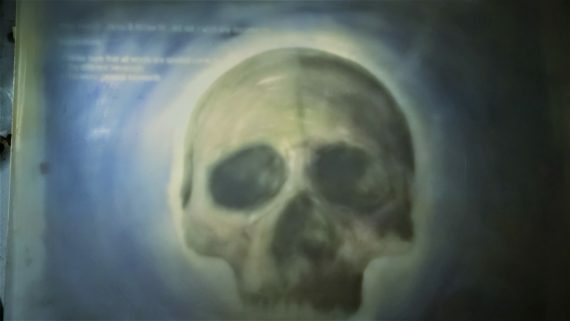 As it was I only had the time to resolve one finished work, in which layers of gold ruby etched text were layered over two overlapping red ‘+’ symbols (created using a dense application of the same precious enamel) in front of a large enameled painting of a skull. This piece was included in Transparency: An LGBTQ+ Glass Art Exhibition at the Liberty Museum in Philadelphia, and may feature in a tour of this same exhibition. 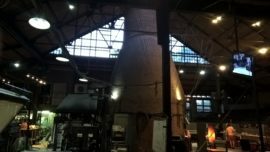 After which, it will become part of the Permanent Collection of the Museum of American Glass.